Iranian Supreme Leader Ayatollah Ali Khamenei revealed on Saturday that holding talks with the US to mend their issues is a "blatant mistake" because Washington fails to stick to its agreements. Khamenei's statements came during a yearly meeting with Iranian diplomats. "Our problems with America are not soluble [and] this should be taken note of, " the Tehran Times quoted Khamenei. "The problem of America with the Islamic Republic is an issue of coming back." "The Americans want to recreate the status they had before the revolution, before the Islamic Republic. They want that. Well, that is impossible. It is not doable. And they are not happy with anything short of that," the 79-year-old stressed. 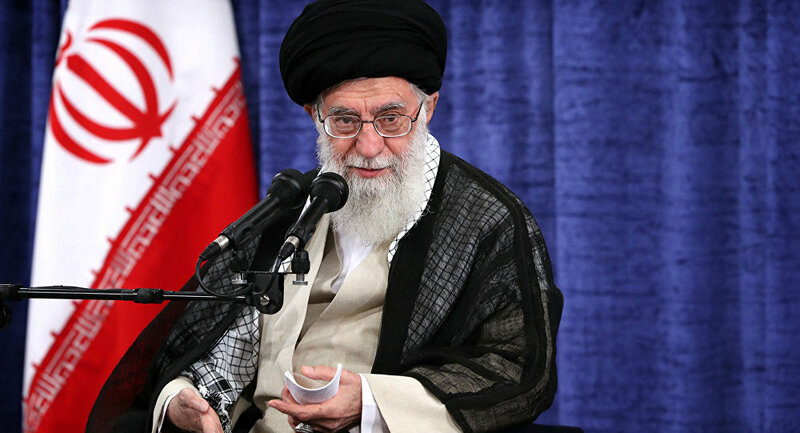 And because reverting back to the times before the 1979 revolution "is not doable," Khamenei stated that "there is no use in negotiations with America [as] it holds no benefit." "The Americans cannot be trusted… they are really not trustworthy. One cannot even count on their signature, let along their word and their verbal promise," he continued. Khamenei's statements follow US President Donald Trump's May decision to withdraw the US from the 2015 Joint Comprehensive Plan of Action (JCPOA), a deal made during the Obama administration that lifted several sanctions in exchange for Iran lowering its nuclear ambitions. The agreement, which included signatures from representatives of China, France, Germany, EU, Russia and UK and the US, ultimately granted inspectors access to Iran's nuclear facilities to verify that Tehran was keeping its end of the bargain. Although Khamenei did indicate that talks with other partners should not be brought to a close, he did warn against waiting for a new agreement to be drawn up. "We should not remain idle waiting for the European package [on the preservation of the nuclear deal]," the official said. "Instead, we should follow up on necessary activities inside the country [against US sanctions.]" With Trump pulling out of the JCPOA, past sanctions that had been lifted against the country will be reinstated. According to the US Treasury Department, the three rounds of sanctions will go into effect on August 6, November 4 and November 5. Remarks made this weekend by Khamenei follow Iranian President Hassan Rouhani's public announcement that suggested the US sanctions would ultimately leave the US more isolated, not Iran.